7500 RPM, High Speed CPU, Graphics. Fadal VMC4020 4-Axis CNC Vertical Machining Center s/n 8508257 w/ CNC88 Controls, 21-Station ATC, CAT-40 Spindle. Fadal VMC40 4-Axis CNC Vertical Machining Center s/n 8508241 w/ CNC88 Controls, 16-Station ATC, CAT-40 Spindle. Fadal VMC40 4-Axis CNC Vertical Machining Center s/n 8409091 w/ CNC88 Controls, 16-Station ATC, CAT-40 Spindle. 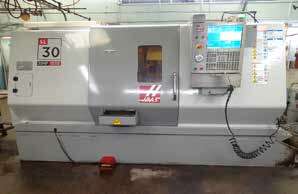 2009 Haas SL-10 CNC Turning Center s/n 3085163 w/ 12-Station Turret, 6” Power Chuck, 16C Collet Nose. (4)Live Positions, 0-4000 RPM on Turret, C-Axis 0.001 Deg, Tailstock, 12” Power Chuck, Exsys S-26 Collet Pad Nose. CNC Enhancements “Auto Bar 400” Automatic Bar Loader/Feeder s/n 565. Chuck, 16C and 5C Collet Noses, Hydraulic Bar Feed. Chuck, 16C and 5C Collet Noses, Econoline Hydraulic Bar Feed. 10” Chuck, 5c Collet and S-26 Collet Pad Noses, Econodyne GBF Hydraulic Bar Feed. Bridgeport Series 1 – 2Hp Vertical Mill s/n 227565 w/ Newall DRO, Chrome Ways. Bridgeport Series 1 – 2Hp Vertical Mill s/n 229775. Bridgeport Vertical Mill s/n 169206 w/ Newall DRO, Bridgeport Shaper Attachment. Bridgeport Series 1 – 2Hp Vertical Mill s/n 241488 w/ Chrome Ways. Baker Bench Model Horizontal Mill s/n PMO5209LG. Webb 15 ¾” x 40” Lathe s/n L7810213 w/ 50-1800 RPM, Inch Threading, Tailstock, Steady, 5C. Webb / Takisawa TSL-800D Lathe s/n BMA800212H w/ 55-1800 RPM, Inch Threading, 5C. (3)Hardinge HC Hand Chuckers s/n’s HC-8336T, HC-3883N, HC-6833N. Hardinge HSL Speed Lathe s/n HSL-5C-1573-E.
Cincinnati Centerless Grinder s/n 36A175 w/ Wheel Dressers. Grindley mdl. U Universal Tool Grinder s/n 655 w/ Motorized Work Head. Cincinnati Tool and Cutter Grinder s/n 6J1P5H-23. Sunnen MBC-1804 Precision Honing Machine s/n 89717 w/ Power Stroke, Auto Sizer. Sunnen MBB-560DR Honing Machine s/n 19798. Falcon Chevalier FSG-618 6” x 18” Surface Grinder. Falcon Chevalier 612 6” x 12” Surface Grinder. Cuttermaster HDT-30 Tool and Cutter Grinder s/n 2540B w/ 5C Endmill Attachment. Quantrad “Comet” CNC Laser Engraving Machine. Videojet “Excel 2000A/F” Inkjet Marking Machine s/n 053345061WDR. Kaeser SK-19 15Hp Rotary Air Compressor s/n 1102 w/ 68CFM @ 110PSIG. Speedaire 10Hp Horizontal Air Compressor s/n D015076. Evapco AT334 Evaporative Cooler s/n 894145. Milmet Co mdl. 1167B 3kW Electric Oven s/n UF500. Nugier H60-7 60-Ton Hydraulic Sliding Ram H-Frame Press s/n 1997059. Kelco CH36C Dry Blast Cabinet w/ Dust Collector. Haberle H350 Pneumatic Miter Cold Saw. W.F.Wells 14” Twin Beam Horizontal Band Saw. Delta 14” Vertical Band Saw s/n BK3656. Walker Turner Bench Model Tapping Machine w/ Procunier Tapping Head. Burr King 200S Vibra-Burr Media Tumbler. Unitek 60 Watt Seconds Bench Model Micro Arc Welder. Troyke NC10ERHR1375 4th Axis 10” Rotary Head. Fadal VH-65 4th Axis 6” Rotary Head w/ 5C Adaptor. Fadal VH-65 4th Axis 6” Rotary Head. Haas 4th Axis 5C Rotary Head w/ Haas Controller. (1000)16C and 5C Collets, S-30 and S-26 Collet Pad Sets. Nikon H-14B 14” Optical Comparator s/n 10222 w/ Acu-Rite DRO. Nikon V-12 12” Optical Comparator. Scherr Tumico 14” Optical Comparator w/ DRO. 2007 Ford E-350 XL Super Duty 12’ Stake Bed Truck Lisc# 8K22459. Komatsu FG15ST-2 3000Lb Cap LPG Forklift s/n 182673A.